With the rise of smartphones and ever increasing capabilities of technology, the entire world has changed. Communication has become instant, business easier and faster to conduct, and travel more and more accessible to the common person. These factors combined are allowing for more people to experience traveling places they would have never imagined before. It doesn’t matter if you are traveling for business or pleasure, technology has completely changed the way it’s done. Applications on smartphones are by far a traveler’s best friend. 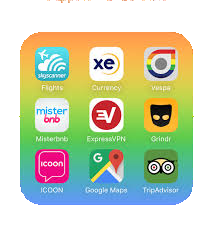 If you are already a traveler or are starting down that path, be sure to download these apps! It may be obvious, but having a GPS in your pocket at all times is invaluable when in a foreign city or country. Having a reliable map app will come in handy more than a few times! Unless you only plan on traveling through places that speak the same language or languages as you, it is always a good idea to have a translation app or dictionary at minimum. Some translation apps allow for offline use in the case you don’t have wi-fi or a data signal. Airbnb is taking over the accomodations world when it comes to traveling. Unless you just need a hotel bed to sleep in for one night, you can get a luxury room in somebody’s house that will host you. For any stay longer than a few nights, give Airbnb a try. At the very least, it’ll be a new experience… and we bet you like it. A lot of people are familiar with the Travelocity website, but they also have a fantastic mobile app. For finding the best airfares, you can set your destination and window of dates, and the app will alert you of deals. It is absolutely fantastic for finding bargain airfare!